We’re big on data here at Viget and, when it comes to recruiting, numbers help us understand how top applicants find us and how we can find them. So, this year, we decided to gather numbers about our internship recruiting process. Our interns have been hard at work all summer. As they enter the homestretch of our program (just two more weeks! ), we've decided to look back at the numbers behind the process that brought them here. * Infographic design by Joseph Le. 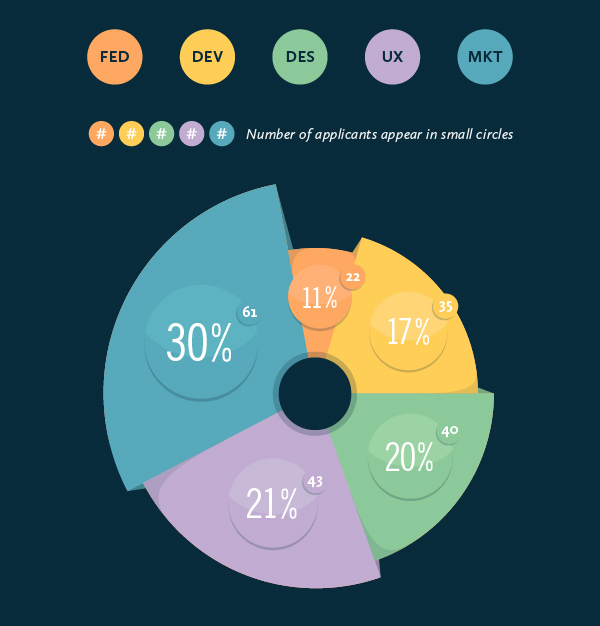 From November 2011 through March 2012, Viget received a grand total of 267 applicants for internship slots across five labs: marketing, back-end development, front-end development, design, and user experience. Is 201 a lot of applicants? Hard to say. 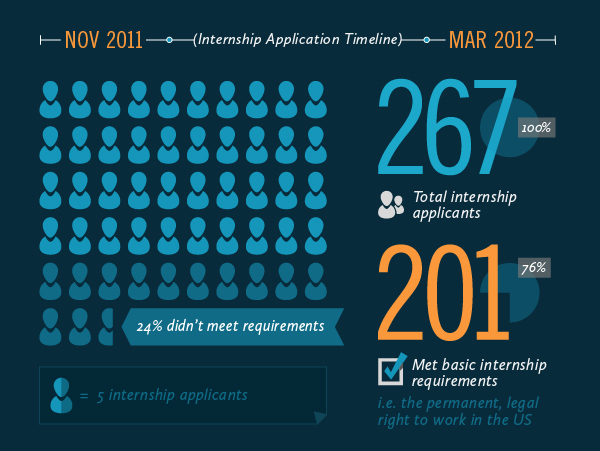 This is the first year that we’ve tracked data about Viget’s internship application process. The number is valuable to us right now mainly because it provides a benchmark for next year. That said, high volume is not our goal. Our goal is to find the right applicants, not more applicants. We use our recruiting process to find more than top applicants. We use it to find next year’s top applicants. We were able to identify a set of 34 students who didn’t quite meet our criteria -- in most instances, because they were still college freshmen or sophomores -- but who showed a great deal of raw talent. We’ll be personally emailing them this fall, inviting them to re-apply. Having that subset of promising future applicants should prove a real boon to next year’s recruiting efforts. It’s all part of our long-term recruiting strategy. 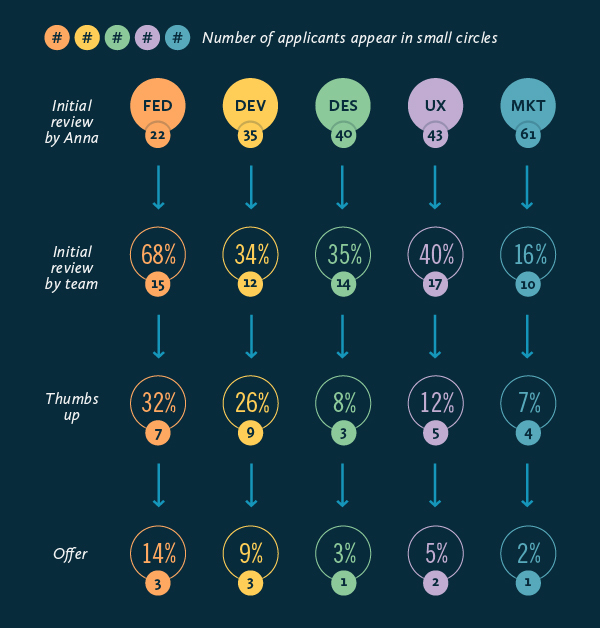 Marketing received the most applicants and our front-end dev team the least. Back-end development, design, and UX were about even. How did applicants find out about Viget’s internship in the first place? We ask all applicants how they hear about us as soon as they apply. Not all respond and some don’t know or remember (typically, not our best applicants!). But, here are the numbers on those who did submit meaningful replies. How did applicants *who got offers* find out about Viget’s internship in the first place? Ten interns got offers. Three of them were already long-term Viget fans when they decided to apply -- they’d originally learned about us through our blogs or our full-timers. Three found us via InternMatch. Two found us via an independent Google search. And, two found us via college career services and SimplyHired, respectively. How well did candidates perform at each evaluation stage? Each lab’s process is unique (as you’ll see in more detail shortly), but they start out in roughly the same way. I perform an initial review and decide which applicants to send to each team. Then, each team gives me a thumbs-up on which applicants to move to a phone screen. It’s in these early stages that the most significant weeding out occurs. Marketing appears more stringent than other labs; but, I think it’s fair to say that we received significantly more low-quality applicants for that internship slot, whereas FED applicants looked relatively strong at the outset. Fewer than half -- for most labs, around or less than 25% -- made it beyond this period of initial review by me and each team. I’ve also included numbers related to offers in the bottom line, so you can see how tiny these numbers get toward the end of each lab’s process. So what happens between that period of initial review and the offer? Each lab does things a little differently, but thoroughness is a top priority across the board. In most processes, we use an exercise to assess a specific skill set. This is especially true for the back-end and front-end dev teams, which each require two separate technical screenings. 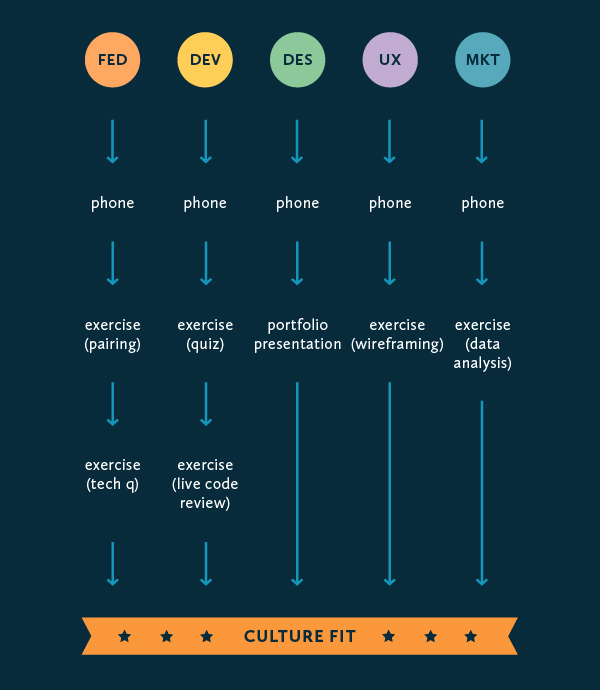 By contrast, the design evaluation process conducts a portfolio review instead of a real-time exercise. Culture fit is something we look for from start to finish. But, we also include one last “culture fit” interview at the end for good measure. If there remain any full-timers who will work directly with the intern and who haven’t yet had a chance to speak with the applicant, now is when we make that happen. Neat. Could things be even better? Yes. We’re proud of bringing on an outstanding crop of interns, but we know there’s plenty of room for improvement. Communication. One of our biggest goals for next year is to share more accurate time frames with our applicants so they know where they stand in our process. Because I joined Viget in October 2011, this was my first time processing Viget internship applicants across our five labs -- and, in some cases, I worked with each team to build the current application process as we went along. Now that we all have a stronger sense of the process for each lab, we’ll be able to share that info more readily with applicants who are under time pressure or just (understandably) eager to know where they stand. Efficiency. And, at the same time, we’ll be able to keep the process speedier. There’s always a struggle between speed and thoroughness but, we’ll be aiming to hit the right place between the two. Marketing. Currently in the works: a spiffy internship page on viget.com so potential applicants can see the awesomeness they’ll (hopefully) be signing up for. We’ll share photos, info on past projects, info on how to apply and what to expect from our process, and updates on where former interns are now. Stay tuned!